What can I say, we went back to the 150's and 160's area today and again, we loaded the boat with a variety of great eating fish. I think the high light of the morning was when Bill boated the 20 pound Mahi Mahi on one of our 700 series IRT Reels. Another good day on the ocean with Great guys and a cooler full of Grey Snappers, Mahi-Mahi, Black Bass, Amber Jacks, Joltheads, Triggerfish, Silver Snappers, Vermillion Snappers, Calico Bass, sharks(all released), and a few fish we couldn't do anything with that either got off or broke the 100 lb. test line like it was nothing!!! 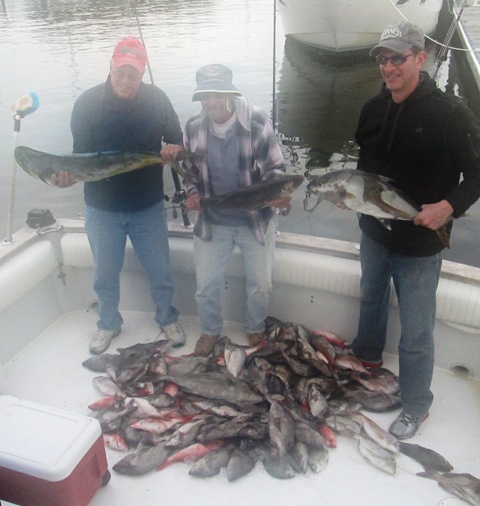 The Fall fishing is really good now, and we are still booking everyday to go fishing. As long as you want to go fishing, we will keep booking mainly because it has been such a good fall season!!! Till next time, God Bless You All!!! PSALM 130:5 I wait for the Lord to help me, and I trust his word.